As I was inspecting my hives today, I came across the above frame. I have been experimenting this summer with foundationless frames. I decided earlier i the season to aggressively replace old, darkened brood comb. Old wax harbors disease and chemical residues. Its thickness alters its vibrational qualities, and the dark color makes it hard for this beekeeper to accurately see eggs. So how to replace it? 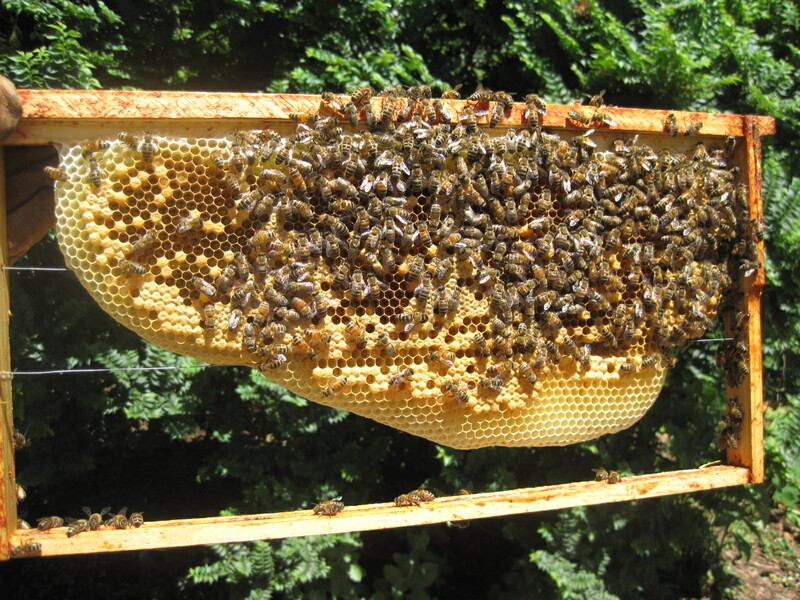 Commercially produced foundation is produced largely from wax sold as by-product from commercial beekeepers, whose hives are often exposed to chemicals I’d rather avoid in my hives, especially in the brood area. While bees pay a high price for making comb (wax “costs” them about 5 pounds of honey per pound of wax), I am wondering if the benefits might be worth it. So far, my bees have made good progress on the few frames I inserted in their hive about three weeks ago. The queen seems to avoid laying in the cells along the lower support wire; the upper one apparently didn’t bother her much. This is far better in my opinion than their chewing away the vertical supports in my wired foundation, leaving strips of near-useless half-drawn comb hanging from the top bar and making me wonder why I went to the trouble and expense!